Lecture 45: Is Pluto a Planet? Classical & Copernican definitions of a "planet"
From classical times, there were seven wandering stars or "planets" that moved relative to the "fixed stars". The Earth was fixed and unmoving at the center of this Geocentric system. With the Copernican Revolution, and the rising favor of the Heliocentric model of the Solar System in the late 17th Century, the Sun took the Earth's place. and the Earth became the 3rd planet. The Moon was recognized to be just a small satellite of the Earth, as were the Galilean Moons of Jupiter (Io, Europa, Ganymede, & Callisto) and Titan, the giant moon of Saturn. The rise of Newtonian Physics in the late 17th and early 18th centuries led to a new awareness of the role of mathematics in the description of the heavens. One interesting manifestation of this was an interest in explaining why the planets had the orbits they did. In 1766, Johann Daniel Titius noted that the semi-major axes of the known planets appeared to follow a simple numerical progression. The "Titius Law" was published, without attribution, in 1772 by Johann Elert Bode, then directory of the Berlin Observatory. It became known thereafter as the Titius-Bode Law. Most contemporaries thought the Titius-Bode Law was an interesting curiosity, but because there was no physics behind it (it is only a numerological exercise), few gave it much further thought. The correspondence between the measured semi-major axes of the planets and the "predictions" of the Titius-Bode law weren't that close in all cases (it placed Saturn at 10 AU, whereas its true semi-major axis is 9.54 AU). It also "predicted" a planet orbiting at a=2.8 AU between Mars and Jupiter that was not observed. Nobody paid much attention to it until 1781. On March 13, 1781, a German emigrant living in Bath England named William Herschel was scanning the sky with his small telescope searching for comets and nebulae, when he came across a new object not in the star catalogs. After a few nights, he found it was moving slowly relative to the stars, and thus was not a star. Within a few months, astronomers had confirmed it was not a comet, but was in fact a new planet orbiting beyond Saturn! To appear resolved in his small telescope, it had to be bigger than the Earth. The new planet was eventually named Uranus, and made Herschel's fame, starting his career as one of the most distinguished astronomers of the 18th Century. The new planet had a semi-major axis of a=19.2 AU. The prediction from the Titius Bode Law was a=19.6 AU! All of a sudden, astronomers began to wonder if there wasn't something to the Titius-Bode Law after all. In particular, was there really a "missing" 5th planet at a=2.8AU between Mars and Jupiter? In the late 1790s, Austrian Baron Franz Xavier von Zach organized 24 astronomers into the "Celestial Police" (Himmelspolizei) to search the gap between Mars and Jupiter for an as-yet undiscovered planet. Began an international program of systematically searching the ecliptic for this unseen planet. The astronomers in the "police" divided the ecliptic into 24 zones of 15° each and began the search. Despite this organization, they were scooped by a most unlikely person. On January 1, 1801, Giuseppe Piazzi, a Sicilian monk of the Theatine Order and directory of the newly formed Palermo Observatory, was compiling a star chart when he found a moving object while searching for the "missing" star Mayer 87 in the constellation of Taurus. By mid-February, the new object was lost behind the Sun, but a tentative calculation put the new body on a circular orbit between Mars and Jupiter with a semi-major axis of 2.8 AU! Piazzi christened his new planet "Ceres Ferdinandea", Ceres for the Roman patron goddess of Sicily, and Ferdinandea as an homage to his patron, Sicilian King Ferdinand III. We now know the body as just Ceres, continuing a tradition of naming planets after Greek and Roman gods and goddesses. Astronomers waited for Ceres to out from behind the Sun in 1802. Von Zach and a young colleague Heinrich Wilhelm Olbers independently recovered Ceres based on a predicted position. Olbers further confirmed that Ceres' orbit was slightly elliptical and tilted relative to the plane of the ecliptic. However, on March 28 of 1802, while searching for Ceres, Olbers found another object in the Mars-Jupiter gap. Its orbit was even more elliptical and tilted than Ceres', but it had the same semi-major axis! This second new planet was quickly named Pallas. The discovery of Ceres and Pallas quickly led to a discussion in the astronomical community about the nature of these new planets. William Herschel, writing to the Royal Society in May of 1802, reporting his observations of the two new planets, and his reflections on their nature. In particular Herschel noted that neither showed a disk when viewed through his 10-foot focal-length telescope, instead appearing like stars. They were much smaller than the other planets. They had orbits that were more elliptical and tilted relative to the ecliptic than the other planets. Ceres and Pallas shared the same orbit. Reading this paper again this Summer during the IAU's debate on the definition of a planet, I was deeply impressed by how many of the issues discussed were first raised by William Herschel more than 2 centuries before! Online version in the JSTOR Archive. Bringing the total to 4 new planets discovered in a brief 6-year period. But after that, no new objects were to be discovered in this region of the Solar System for another 38 years! By 1838, an astronomy textbook written John Herschel (William's son) listed 11 planets in the Solar System (curiously, he did not use the word "asteroid" coined by his father). During the first half of the 19th Century, observations of the orbit of Uranus showed that it deviated from its predicted path as calculated using Newtonian Gravity. The deviation was ascribed to the gravitational pull of an as-yet unseen massive planet orbiting somewhere in the vicinity of Uranus. Calculations done independently by Urbain Leverrier in France and John Couch Adams in England suggested that there must be a massive 8th planet beyond Uranus. Leverrier convinced the Berlin Observatory to look at the place on the sky where he predicted this 8th planet should be, and on September 23, 1846, Johann Galle found the planet Neptune. Neptune was as big as Uranus, and orbiting with a semi-major axis of 30.6 AU. Neptune, however, did not fit the "prediction" of the Titius-Bode Law (38.8 AU), which is one reason why the Titius-Bode Law quickly fell out of favor in the 19th century. Nobody has taken it seriously since. The dramatic discovery of Neptune, based on predictions from Newtonian physics, rather than the vague numerology of Titius and Bode, led to a reconsideration of what it meant to be a planet. By 1865, John Herschel's astronomy textbook listed "more than 50 planets", of which 8 were the large planets and more than 50 were "asteroids". In 1851, Encke introduced a numbering system for the asteroids, but starting with the 5th asteroid, Astraea, as number 1, leaving the original 4 (Ceres, Pallas, Juno, & Vesta) unnumbered. In 1854, Jahn introduced the term "minor planet" to apply to asteroids, acknowledging their status as much smaller than the other 8 planets. In 1868, the numbering system of Encke was revised to include the original 4 asteroids, renaming them 1 Ceres, 2 Pallas, etc., establishing the system we use to this day. In general, without much fanfare, the number of planets was reduced to 8 (Mercury through Neptune), and all the minor planets were designated as "asteroids" and dropped from the list of planets. By the end of the 19th Century, the introduction of photography led to the discovery of many 100s of asteroids per year. At the end of the 19th Century, there were 8 planets, but not everyone was convinced that the celestial census was complete. Percival Lowell (1855-1916) was a wealthy scion of one of Boston's leading families, whose interest in astronomy led him to use his fortune to build a private observatory near Flagstaff, Arizona (known today as the Lowell Observatory, it remains one of the premier private research observatories in the United States, best known for its solar system research). Among Lowell's interests were his studies of the "Canals of Mars", which we now know are an optical illusion, but which Lowell thought proved that there was intelligent life on Mars. However, Lowell was also interested in searching for new Trans-Neptunian planets. He started using orbital data for Neptune, and claimed that these data showed residual discrepancies between prediction and observations that were consistent with a gravitational tug from an as-yet unseen 9th planet. Lowell began his systematic search for "Planet X" in 1909, and continued it from 1913-1916, using photographic techniques for his search. Lowell died in 1916 before completing his search. Later re-analysis of his photographs showed that Lowell had actually photographed Pluto twice, but not noticed it (it is not clear how carefully he examined his own photographs at this time). With Lowell's death, and the inevitable fight over his estate, the search was not revived by the Lowell Observatory until 1928. In 1929, Lowell Observatory hired a young Missouri amateur astronomer named Clyde Tombaugh (1906-1997) to resume the photographic search for "Planet X" started a decade earlier by Percival Lowell. On February 18, 1930, using a pair of plates taken 6 nights apart in January of that year, Tombaugh discovered a tiny moving objects in Gemini. Subsequent observations showed that it was on an orbit beyond that of Neptune. It was soon named Pluto, and immediately hailed as the 9th planet in the solar System. The discovery of Pluto also almost immediately began to generate controversy among astronomers. It was clearly bigger than Ceres, and apparently larger than the Earth in some early estimates, but it was not large enough to explain the discrepancies in the motions of Neptune that Lowell had used to initiate the search. Early estimates of Pluto's size were too big, and subsequent work showed Pluto was in fact smaller than the Moon, and thus way too small to have caused any measureable orbital perturbations of Neptune. The orbit of Pluto was very elliptical and tilted by more than 17° relative to the ecliptic, unlike any other planet. In retrospect, the discovery of Pluto was somewhat fortuitous. It was not the object that Lowell had been seeking at all. Still, nobody had found any other Trans-Neptunian objects except for Pluto, so it remained unique and its designation as the 9th planet remained mostly unchallenged for much of the 20th Century. In 1992, using modern, sensitive digital CCD camera technology, Dave Jewitt and Jane Liu of the University of Hawaii discovered the first small Trans-Neptunian Object, 1992QB1. All of these pass near Neptune's orbit, and so have their dynamics controlled by Neptune's gravity. All, however, were much smaller than Pluto, but as time went on, progressively larger TNOs were discovered. Now, to some astronomers, Pluto was not just a small planet with odd orbital and physical characteristics, but the largest of a new class of icy Trans-Neptunian worlds. This led some to question its continued classification as a "planet". 2003UB313 - A 10th Planet? 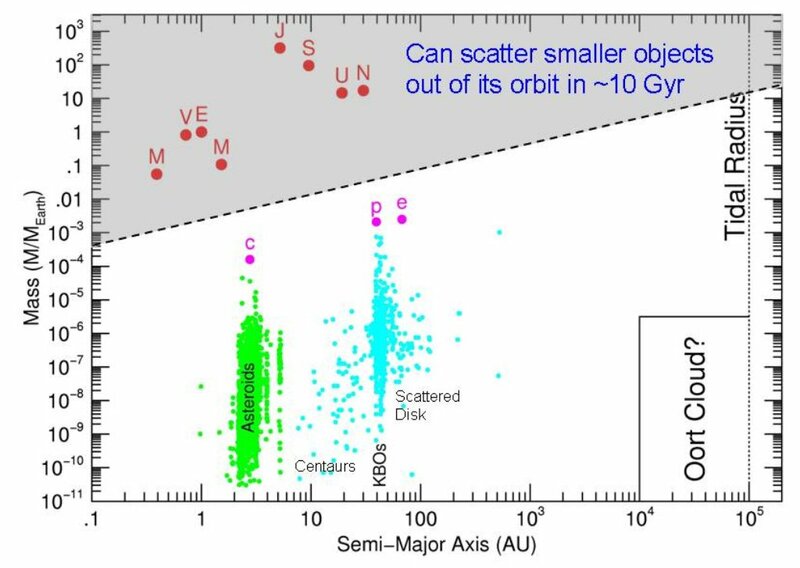 In January 2005, astronomers Mike Brown (Caltech), Chad Trujillo (Gemini Observatory), and David Rabinowitz (Yale) discovered a Scattered Disk Object that was larger than Pluto. Semi-Major axis of 67AU, and Period of 560 years. The preliminary designation was 2003UB313 (their first images were from 2003, before they recognized the object in their data). The team always gives whimsical code names to their large TNOs, this one was code-named "Xena", for the titular character in the TV series Xena: Warrior Princess. By 2005, this team had perfected a technique for finding large TNOs, and had in fact discovered many of the TNOs larger than 1000km in diameter - more than any other team, of which there were now more than a half dozen, of which the largest by far were Pluto and 2003UB313. If "Xena" was larger than Pluto, then either it was the 10th planet, or Pluto was not a planet but a large TNO. The discovery of "Xena" crystallized a growing debate in the astronomical community about the precise definition of a planet. Despite nearly 3 millennia of study, there was no consistent physical definition of a planet. In late 2005 the International Astronomical Union (IAU) established a committee to examine the issue and present recommendations to the IAU General Assembly Meeting scheduled to be held in Prague in August 2006. Note that the committee's charge was not to specifically address the status of Pluto, as it is often misrepresented, but to instead address the more generic question of a scientific definition of a planet. The discussions at the Prague meeting were webcast, and rather contentious. The main axis of contention was between those who felt that the planet's properties itself were most important and those who felt that the planet's orbital dynamics must also play a role in the definition. is in orbit around the Sun, and not a satellite of another planet. The third criterion is often known as orbital dominance, although the wording of the final IAU resolution is somewhat vague ("cleared its neighborhood"). This has become the main focus of remaining contention over the new definition. The largest 8 planets satisfy all three criteria, and are thus designated as Planets by the new IAU definition. Pluto, 2003UB313 (aka Xena), and Ceres satisfy the first 2 criteria, but are not the dominant objects in their orbits, so these three objects have been designated as Dwarf Planets. There are about a dozen other candidate Dwarf Planets, mostly large TNOs, pending subsequent observations to confirm they are in hydrostatic equilibrium. The name is very appropriate given the considerable fuss attending the discussions at the 2006 IAU General Assembly meeting. These are the official names, specified for use in subsequent scientific papers, although the short forms "Pluto" and "Eris" will be the more common usages. The main physical distinction between a "Planet" and a "Dwarf Planet" is whether or not it is the dominant object in its orbit around the Sun. Most objects near the Earth have their orbital evolution dominated by the Earth's gravity (the largest Earth-crossing asteroid, (1036)Ganymed, only has as mass of about 10-8 that of Earth). Ceres and Pallas share an orbit, and neither can be said to "dominate" the orbit gravitationally. Pluto is the largest of the Plutinos which are in a 3:2 orbital (mean motion) resonance with Neptune, so its orbit is not only shared, but it is determined by Neptune's gravity. This idea is still contentious, largely because the language in the IAU resolution was rather vague and technically imprecise ("clearing the neighborhood"), thus leaving proponents of the "Pluto is a Planet" idea room to maneuver. Mass vs. Semimajor Axis for Solar System bodies. The gray region indicates those bodies massive enough to have cleared a substantial fraction of the small bodies out of their neighborhoods after 10Gyr. Pluto and Eris are at least a factor of 10 outside this region. and nearly 4 orders of magnitude below the least massive planets (Mercury & Mars). This diagram shows better what is meant by "orbital dominance", and shows how Pluto and Eris don't even come close to meeting this criterion. Eight Planets: Mercury, Venus, Earth, Mars, Jupiter, Saturn, Uranus, and Neptune. NASA has officially adopted the IAU nomenclature, as have many, but not all, astronomers. A group of astronomers, primarily led by Alan Stern, Principal Investigator of the New Horizons mission currently en-route to Pluto and the Kuiper Belt, have expressed opposition to the IAU definition, so we haven't heard the last of this. Personally, I think the new nomenclature for Solar System bodies is basically sound and makes physical sense. Pluto is more scientifically interesting in its new role as the largest of the resonant Kuiper Belt than it ever was as a small, oddball planet that didn't really fit with the other 8 planets. The contention about "clearing the neighborhood" can be resolved by adopting clearer language about what is meant by "orbital dominance". My opinion is that the imprecise language was a consequence of a misbegotten attempt on the part of some on the IAU committee to make the language of the resolution more "accessible" to the "general public". If astronomers are to make a major revision in the nomenclature of the Solar System, we have an obligation to explain ourselves to everyone, astronomer and non-astronomer alike, but to tweak the technical definition to make it more "accessible" was a mistake. Scientific definitions require precise language. All that this poor choice of language (which was not in the penultimate draft of the resolution) has accomplished is to sew confusion. We have redefined what we mean by a "planet" many times before, and each time it was motivated by new knowledge that changed how we looked at the heavens. This is how science works - it is self correcting, and doesn't allow tradition or sentiment to dictate ideas. Pluto is no longer a planet because we have learned more about what it is, and to insist otherwise is to cling to old ideas that are no longer correct or relevant. Far from being "demoted" or "banished" to quote a number of new headlines, Pluto is now taking its rightful place among the largest of a fascinating new class of objects that have much to teach us about the evolution and origins of the Solar System.